Few words are as important as “if”. It’s used in everyday life, as well as excel sheets and other forms of coding. Now, with the rise of IF Adwords for Google adverts, there’s a lot for an SEO agency to benefit from as well. 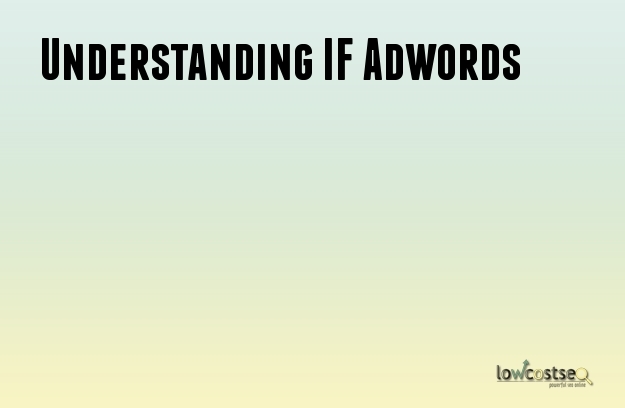 Unlike the typical adwords we are familiar with, IF adwords let you display different messages if certain criteria are met. If there the user is on a mobile device, as opposed to a desktop computer. If user is on a valid list of users within your account. IF coding can be set up to change lines of text based on if either of these factors are met. This changes the final advert that is displayed, allowing you to be more versatile with every opportunity. In a word, yes. For many businesses – especially e-commerce – PPC advertising has been a great way to draw people in. The one thing it lacked, of course, was a personal touch. While IF functions only allow you to sort through some basic criteria, it nonetheless allows you to address different niches within your audience. The ability to detect a mobile device speaks for itself. People on mobile devices value being able to do things on the go. As a result, the way you advertise your business might change. Instead of focusing on a discount, or how cheap your delivery rates can be, you might instead choose to focus on how many stores you have nationwide, or just how quick your deliveries are. Let’s use a restaurant for an example: someone at home might be more eager to book a table in advance, whereas someone in town already wants to be able to walk-in. Can your adverts reflect this? Maybe. It will certainly require a little bit of research to understand your audience. Yet this may be a very simple, yet effective way to increase your click through rate. What about using valid lists of users? This is much broader than it seems. The lists you compile can be based on whatever information you have. In Google’s own example, it suggests keeping a list of “cart abandoners” - people who were going to make a purchase on your site (I.e, they even had products in the cart, ready to be checked out) but ultimately changed their mind. You could then, using Google’s scenario, offer a 15% discount, rather than just 10%, which normal users would see. Why is this important? These users were already willing to deal with your website, but ultimately require a little extra temptation. Of course, this is just one situation. Different companies will be able to maintain different user lists depending on their business. Since its still only in its pilot phase, perhaps it’s too early to tell. Yet the potential is certainly interesting.